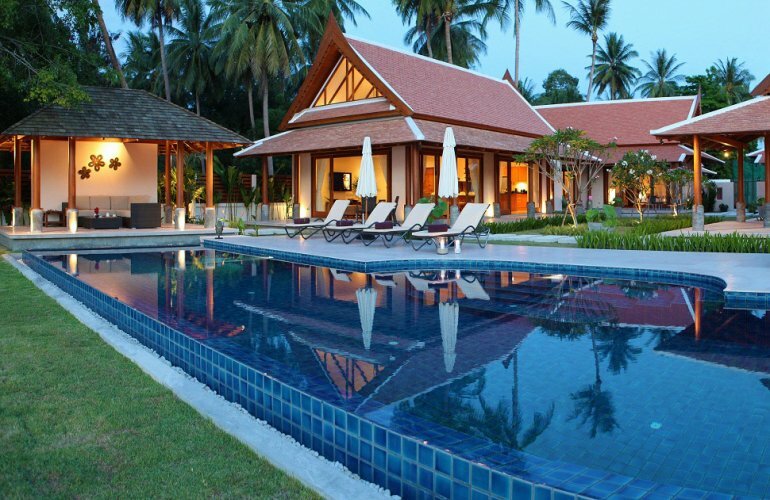 This remarkable oceanfront villa on Lipa Noi beach is truly a piece of paradise. The stylish and unique property is one of two identical five-bedroom homes with a contemporary layout, designer furnishings, a vast infinity-edge pool and a shared flood-lit tennis court. Located on Koh Samui’s popular west coast this elegant yet relaxed home sits in tropical surroundings with stunning island views all around. This fully air-conditioned villa offers bright and spacious accommodation presented in a fusion of contemporary and traditional design. Four detached pavilions are arranged in immaculate proportion around a central garden and pool terrace facing the crystal clear sea. The villa boasts two sleeping pavilions at the rear and two further pavilions at the front comprising the master bedroom suite and living area. An identical sister property next door makes this vast property the perfect home from home for families, large groups, corporate events and special occasions. Facing the pool and ocean beyond is the living pavilion which features a stylish open plan lounge and dining area, a fully equipped kitchen, polished terrazzo flooring, high vaulted ceilings, designer furnishings and floor to ceiling glass doors that open out onto the beautiful garden and pool area. The open plane lounge is furnished to a high standard with neutral décor, comfortable sofas, a traditional-style coffee table, and organic rug. Facing this area is a wall-mounted satellite TV/DVD, stylish ornaments and a beautiful Thai wood display cabinet. Beyond the living area lies a heavy antique cabinet and dining table with seating for 10 guests. From the dining area guests can enjoy 360 degree views over the pool area, gardens and ocean as well as views of a magnificent mythological carving located beyond glass doors to the rear. The dining area is served by a contemporary kitchen with wooden units, modern amenities, dramatic black polished worktops and doors leading to a further staff kitchen. A spiral staircase leads up to a bright and airy mezzanine ideal as a den for older children. Adjacent to the living area is an impressive bedroom pavilion hosting the grand master suite complete with its own spacious lounge, en-suite bathroom, large dressing room, spiral staircase and private mezzanine office. The bedroom features a large double bed, designer furnishings and stylish décor with glass doors that open onto the pool terrace allowing for panoramic ocean views. The elegant stone-tiled bathroom features an imposing free-standing terrazzo tub, walk-in shower and separate doors leading to a private garden area with sea views. The stylish lounge features comfortable sofas, attractive furnishings and stylish artworks. A spiral staircase leads up to a private office on the mezzanine floor above. Two further bedroom pavilions are located at the rear of the home each complete with 2 bedrooms each; 3 doubles and one twin. Each bedroom features wooden floors, high vaulted ceilings, stylish ornaments and art works and en-suite bathrooms with twin sinks and indoor and outdoor showers. All bedrooms open onto verandas and the garden. At the heart of the home lies the magnificent gardens and pool area. The immaculately manicured gardens are planted with Frangipani trees, exotic plants and palms that lead down to a vast infinity-edge pool and stone washed sun deck. At the poolside is an alfresco beachside dining sala with an elegant dining table and rattan seating for 10 guests. A walkway leads directly onto the white sandy beach complete with luxury sun loungers and parasols. Further front facing sun loungers are cleverly placed along the pool for stunning ocean views and the perfect place to relax in the sun. At the end of the swimming pool is a comfortable lounge sala, an outdoor shower and doors that open up the property to an identical home next door. A walkway leads around the side of the living pavilion to a bathroom that can be accessed from inside or outside the building. This stunning villa in Koh Samui can be rented independently or together with its sister property to accommodate parties of up to 20 guests. Complimentary WiFi internet is available through both homes and a team of friendly staff are on hand to attend to your every need. A floodlit tennis court at the rear is the perfect place to keep active during your stay, plus there’s plenty to do with an array of restaurants, bars, shops and cultural sites located nearby on this charming tropical island.